This Mangowood Shooting Yarn Bowl is made in India and has been expertly handcrafted out of Indian Mangowood, a sustainable wood. 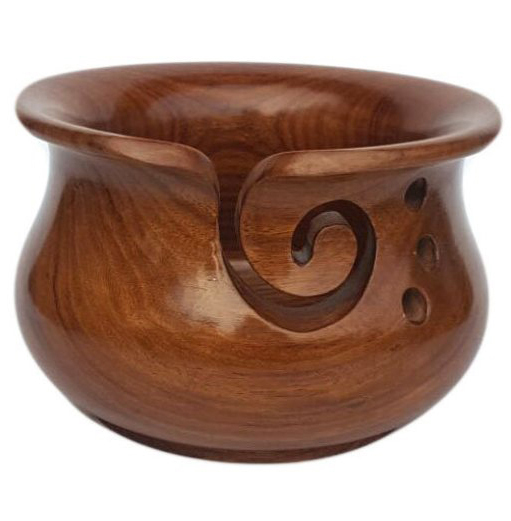 Place your yarn in this beautifully handcrafted mango wood shooting yarn bowl holder and keep it from running away. Mangowood is heavy enough to help keep this yarn bowl from slipping on surfaces, but light enough to take with you when you’re on the go. This wooden yarn bowl will help keep your yarn clean, in place AND will help you have great yarn tension as you crochet or knit your projects. This mango yarn bowl will help keep your yarn clean, in place AND will help have great yarn tension as you crochet or knit your projects. The deep cut spiral helps to keep yarn in place as you work. Each yarn bowl is original and unique.